Quick Table Contents Lookup using the standard Quick Documentation Lookup action. Try Ctrl+Q on a table name anywhere in the IDE! Try all this in the latest EAP and let us know what you think. This entry was posted in Cool Feature, PhpStorm and tagged database, PhpStorm. Bookmark the permalink. I set up Data Source. I have autocomplete for tables names in database console tab. How I can get autocomplete at least for tables names in .sql files? How do you set it up? The add connection dialog is not self-explanatory nor could I find any info on it. It asks me for a java.sql.driver file, I’m really lost. You need a JDBC driver for your database in order to communicate with it. You can try google it yourself otherwise you can use the “Find JDBC Driver on the Web” button in the panel toolbar. 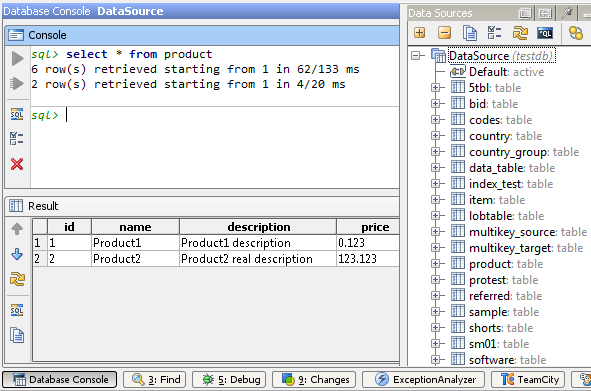 Completion works in *.sql files just as it works in console. If you have troubles with it please visit our forum at http://www.jetbrains.net/devnet/community/idea and ask this question there. Don’t forget to provide more information concerning the problem such as SQL dialect, statement text, place of completion. @gregsh I asked my question here: http://www.jetbrains.net/devnet/message/5259027 . Hope somebody has answer.